We do not ship to P.O. BOX addresses. Please provide full street address for shipping. Extra shipping charges could apply if you’re ordering from outside of US/Canada, Europe or Australia. Get 1 More Cover FREE! Our PhotoShield is a high quality clear cover. Incorporating a thin diffusion lens, designed to defeat cameras! Our design is effective, inconspicuous and defeats most cameras! NOTE: Check your local DMV laws before buying. 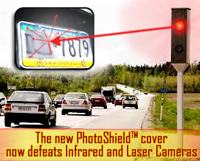 WARNING : We do not Condone the use of our product to defeat toll booth cameras. IMPROVED lens design works to absorb and diffuse incoming laser beams from laser guns, helping to prevent an accurate reading. AVOID COSTLY TICKETS! New & Improved, Patent - Pending! NOT so inconspicuous; a strong silver reflection is apparent at certain angles. Everyone will know that you have it on. International Size Available. New Light Bending Technology! *** 30 day money back guarantee*** . 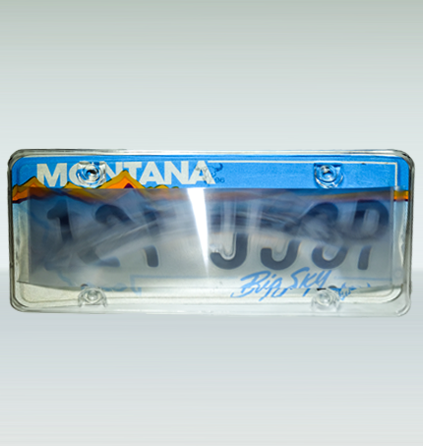 "License-plate spray foils traffic cameras" Washington Times "
Note : Buyer assumes all responsibility for using this cover in compliance with local motor vehicle codes in their area of vehicle use. Let your friends know all about the great deals that are on offer at this site. Just fill in the details below and click "Send"